Reviews | #40 Round Squeeze Handle Disher Portion Scoop - .875 oz. #40 Round Squeeze Handle Disher Portion Scoop - .875 oz. Constructed entirely of 18-8 stainless steel, this 7/8 oz. #40 round disher has a squeeze handle design that allows you to use your whole hand instead of just your thumb to activate the blade. This cuts down on fatigue with extended periods of use. The blade extends beyond the bowl to prevent sticking and it can be used with either the left or right hand. Best for softer foods and low volume use. These scoops are so great! They are easy to use over an extended period. Plus they are so much less money here than my local stores. I use this scoop for measuring out our cookie dough. Now all come out the same size. I have one of the girls that's left handed and this works perfect for her. Very well made. Will last a long time. Good size for a cookie, but not sturdy enough for cookie dough and repeated use. Kept coming apart and breaking. I won't be purchasing these in the future for cookie scooping, maybe for something of softer texture. If you bake cookies often, this product will save you a lot of time. You can get cookies in the same size. This particular size is for making larger cookies, and #60 is great for small cookies. It is nice and sturdy. It is made of durable material. Helps me scoop out same size cookie dough for even sized cookies. I recommend this product! Just another humdrum little gizmo that home cooks might not know about. Ever wonder how pro bakers get all of their cookies to be the same size? This is how they do it. Pretty much the same as the other brand version but without the plastic handles or 3 times the price. I love this #40 size scooper. I was using a smaller one and dipping out my cookies with a double scoop. This is just the perfect size for big cookies. I like to make my cookies the size of the palm of my hand and this is perfect. Very durable material. This squeeze handle scoop does the job! I used it to make sausage balls this weekend. Sometimes the hook got moved, but i was scooping heavy sausage with it.. I simply adjusted it back in place and continued on. I have purchased a variety of theses scoops. I love how much time I save. I able to scoop whatever I choose. I always get perfect portion control. If it is for cookies, cupcakes, muffins, etc. All of my goodies come out the same size. I am also able to bake all items equally due to them coming out the same size from portion control. This scoop is really good at being able to make sure that all of your ingredients are portioned correctly. It controls expenses and ensures a properly rotated product. These are not very durable. I was using these for soft cheese and they usually break very very quickly. Some have broken in as little as one day. We appreciate your review, Jason! We are sorry this portion scoop did not work for your intended use. If you are looking for a different product that would better suit your needs, please contact our Customer Solutions team. This product is great for scooping small sized cookie batter. It released the product with the batter sticking and it can withstand daily extensive use. Love this disher! It is the perfect size for cookies, for scooping batter into muffin tins, for scooping ice cream, or really for anything! This size is so versatile, and the palm squeeze dishers are much easier to use I find. These portion scoops are great. They are heavy duty and perform well in our setting with students. I like that the size is stamped into the sweep for easy identification. This is the perfect size for all of my cupcake and muffin recipes. The measured scoop makes all the cupcakes and muffins a uniform size. Good scoop, we use these everyday for hours in food prep. They clean up nice and even if you bend the inner bar, it snaps right back into place. I love this scoop for making lots of cookies in bakery. They come out evenly every time and they're all the same size when they're finished. This scoop is a great way to keep portions accurate and make sure that your recipes are being made accurately. It's easy to clean as well, which is a plus! I have and use a couple of these daily. Great for controlling portion size and they work and clean up easily. Great item at a good value. We have been using these to get batter out for cupcakes and cookies. It allows for an easy and even pick up for thfor dough. The hand scoop allow us to have the same size cookies, meatballs whenever we use it everything looks uniform. Holds up on daily use well and clean up is simple. Unfortunately this disher broke after only several uses we were scooping cookie dough. The mechanism in the scoop bent and then broke off. We did not feel that it had an unusual amount of stress. Thank you for the review, Lisa! We're sorry this scoop broke so quickly. A Customer Solutions Representative will contact you shortly! We use dishers to make uniform cookies at our shop. It makes the job so much easier. Only been using this one for a short time. My favorite is the #50. It is a little smaller but great for cookies in a container. This is a very nice, sturdy, easy to use scoop. I like the smaller size for cookies and am going to try it for cupcakes. It looks like the perfect size. Even with arthritis my hand was comfortable the entire time I was using the scoop. This is a great small disher that is perfect for cookies. I plan on getting many of all different sizesx they are great to have on hand for think batters as well. Super sturdy!! I bought it to scoop chocolate chip cookie dough, but frequently use it for rock-solid ice cream, and it cuts through the cold ice cream very well. We own the #40 #50 #60 and #70 sizes. This one we use for our largest applications. The quality on these are fantastic and should last forever. The number 40 round squeeze handle disher portion scoop - .875 oz is a great buy for making that perfect muffin or cupcake giving a professional look to you r goodies! Excellent. Purchased a disher from a local gourmet shop only to have it fall apart in my hand the second time using it. I purchased this one through Webstaurantstore.com and it works. I have put it to good use and am very happy with its quality , weight and construction. I actually ordered two in case one would fall apart, but it is so well made, I don't have to worry about that, so the extra one is going as a gift! We are very happy with this #40 Round Squeeze Handle Disher Portion Scoop - .875 oz.from Webstaurantstore. We bought multiple sizes for our kitchen use. This disher is the perfect size for cookie dough. Allows us to quickly portion out dough as well as roll it into a ball quickly and uniformly. I use these scoops to scoop my cookie dough. The scoop holds about 3 1/2 teaspoons. It has a strong spring and is very sturdy. I scoop out the cookie dough onto parchment paper, then freeze it and pull out the cookie balls when I feel like having cookies! I love this scoop! It is perfect for scooping cake batter into cupcake liners, I also love using it for my cake pops. I plan to purchase more, they are very sturdy. This scooper is durable. I use this one for a smaller cookies like thumb prints and my small portion of chocolate chip cookies requested by customers. This scoop is not only great for making perfectly round and uniform cookies but also for making meatballs. My only tip is that if using for cookies, do not let the dough chill too long as it can be difficult to scoop and may get stuck. Great scooper for a kids ice cream since it is small amount and you know the kids when they have to much sugar. This even works for decorative desserts. 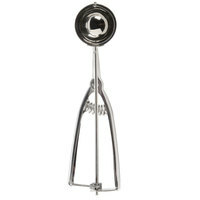 This scoop disher is great for making fritters and other small finger foods! Great for easily portioning batters of all sorts! Fantastic for baking cookies!!! This scoop is the perfect size for drop cookies! This way you get uniform cookies which all bake in the same exact amount of time. I need several more of these! This is a tool you didn't know how much you needed until you had it. This is great for portioning small bites and samples, as well as pastry and baking applications. The disher has a sturdy, comfortable feel in hand and the spring loaded handle releases easily. Great value. Highly recommended. Best for left or right handed baking or scooping. Helps to ease hand fatigue, because you can switch hands. Great for large batches of cookie dough. I use this small scoop to scoop mini cupcakes and small cookies. It scoops the perfect amount of dough for 2" cookies and is easy to clean. Highly recommend this disher. Not only is it good for ice cream, but I use it when baking cookies. The size is perfect for scooping out the dough and making small-medium sized cookies. Good build quality and easy to clean! Smooth movement, good quality materials, easy to use, easy to clean, even portion control, fits in your hand nicely. I would purchase this item again. This is a well made piece of equipment for the home kitchen. I use it for scooping out the perfectly sized cookie. Dishwasher safe, it comes completely clean.